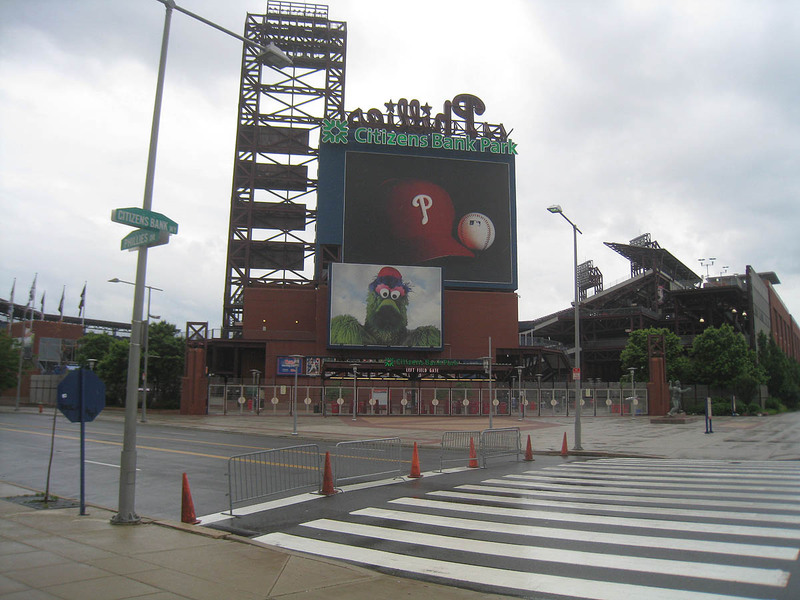 It was a dreary day in Philadelphia . . .
. . . but that didn’t stop me from driving down from New York City. Wanna know why? Because the Astros were in town, and I wanted one of their commemorative baseballs. In the photo above, pay no attention to the player grabbing his crotch. (Oops, too late.) Instead, take a look at the guy who’s wearing shorts. See the black thing that he’s carrying? That was the ball bag. I just *knew* (or at least suspected, or at least hoped) that the bag contained at least ONE commemorative baseball, and dammit, I was going to snag it. 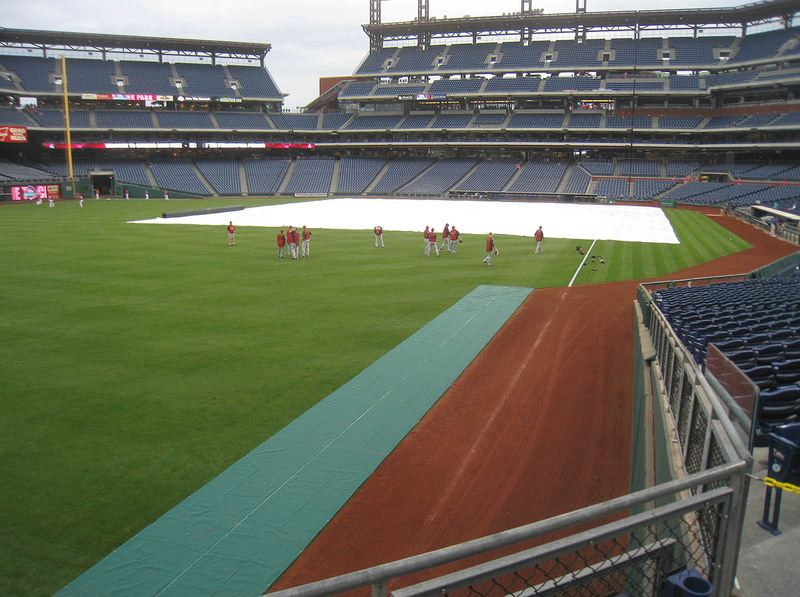 In the photo above, do you see the players near the right field foul pole? 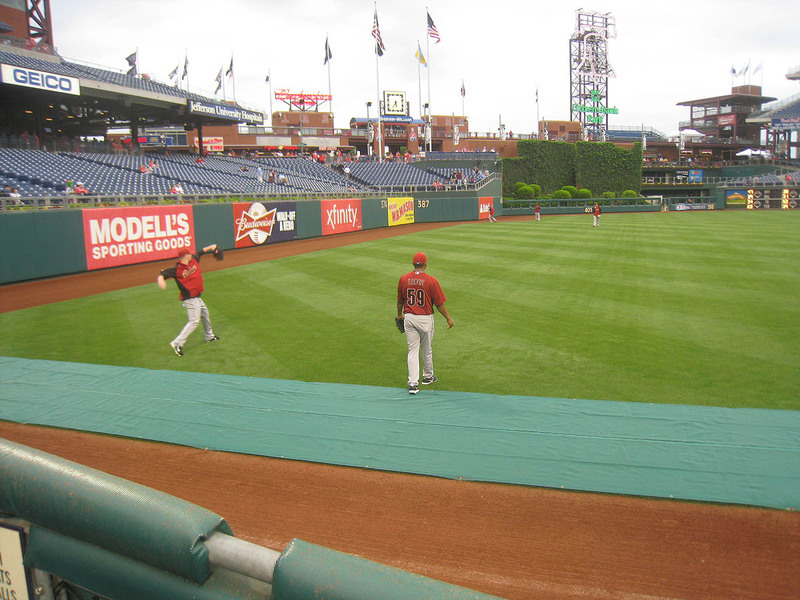 Those were Phillies pitchers, and as far as I was concerned, they meant nothing. This day was all about the Astros, but unfortunately, I couldn’t get any closer to them until 5:35pm. Do you see the yellow chain in the photo above? It’s barely creeping in from the right edge. That chain extends all the way back to the concourse. 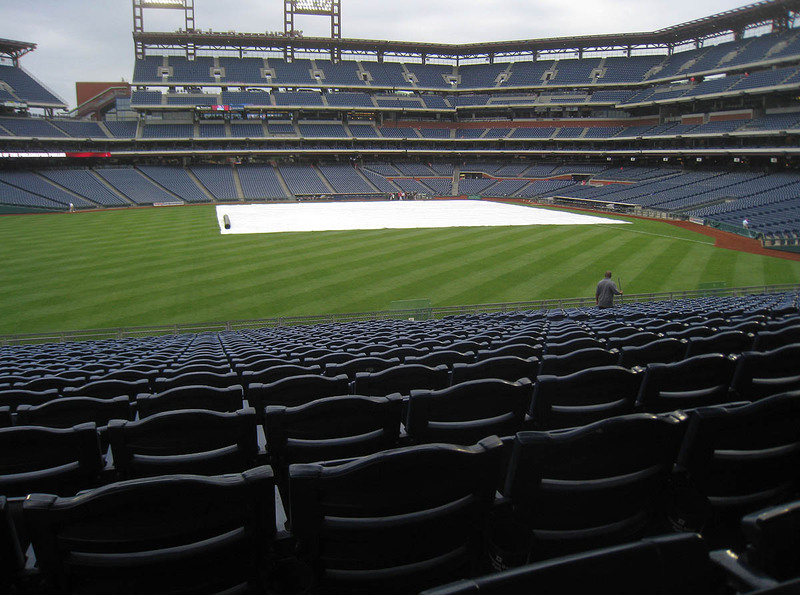 It’s there to prevent fans from spilling prematurely into the rest of the seating bowl, and for a little while, I was concerned that the Astros would finish throwing while I was trapped in the left field corner. 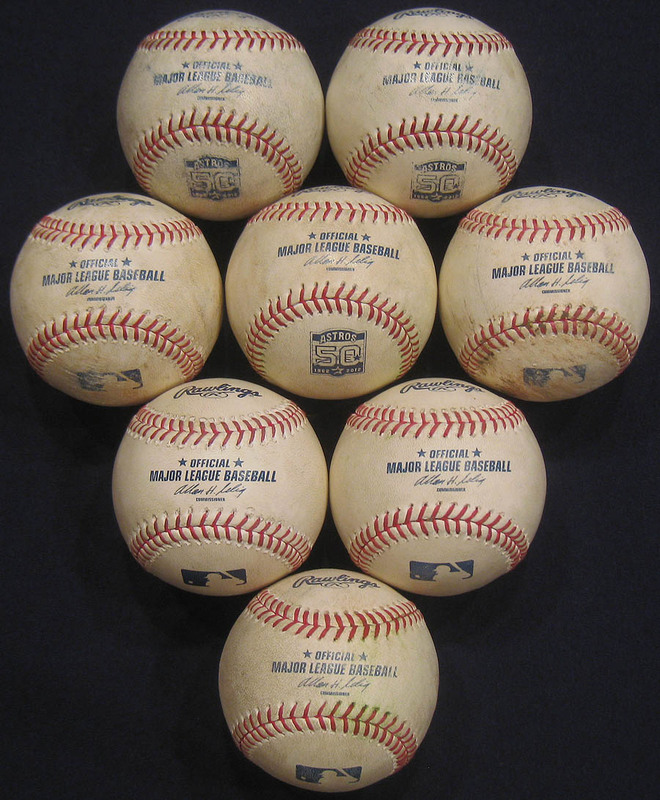 That made a huge difference because I was able to attempt to see the logos on the baseballs that were being used. Brandon Lyon and Brett Myers? It was hard to tell at first with them. Lyon was about 30 feet away, and every time he transferred the ball from his glove to his throwing hand, the logo was facing the wrong way — or he just did it too quickly and I couldn’t tell. Eventually, though, I was able to determine that they were *not* using a commemorative ball. 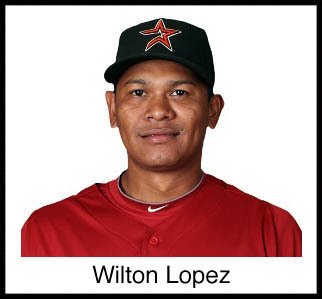 Then there was Wilton Lopez — the player wearing No. 59 in the photo above. I had a tough time seeing the logo on his baseball until he failed to catch an in-between hop. The ball scooted right between his legs and trickled near me on the warning track. IT WAS COMMEMORATIVE!!! There was a big “50” on it. That’s all I needed to see. My God. I had to have it. I mean, I seriously HAD to have that ball. Before Lopez even had a chance to pick it up, I asked him (politely and in Spanish) if he’d give it to me when he finished. He didn’t say anything, and I had no idea what to think, but my mind was racing. Meanwhile, when Lyon and Myers finished throwing, I made sure *not* to ask for their ball because I knew what would happen. Lopez would see me catch it, and then he’d decide to give the commemorative ball to someone else. There’s no way that I was going to allow that to happen, so I just stood there quietly and waited to see which other fan Lyon was gonna toss it to. Wanna guess what happened? I’ll tell you what happened. Lyon spotted me in my Astros gear and threw the damn ball to me! It was probably the only time in my life that I *didn’t* want to catch a baseball, but I had no choice. If I hadn’t caught it, it would’ve hit me. 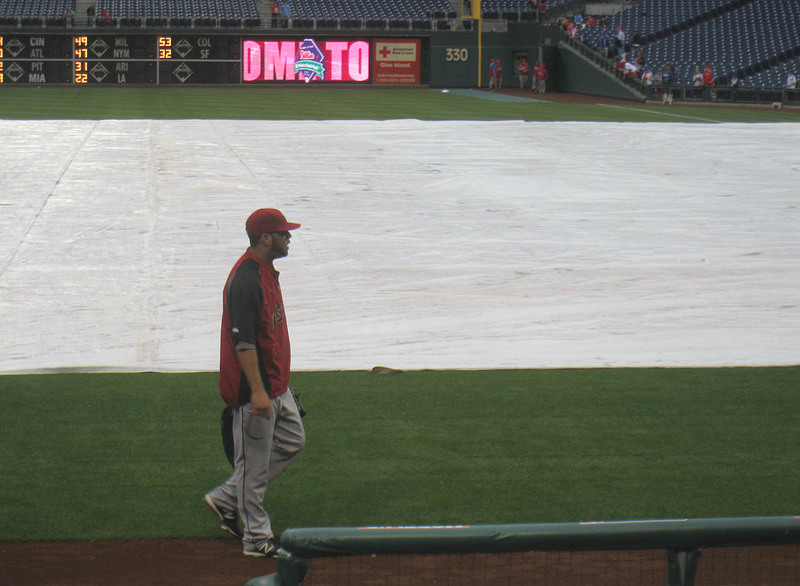 I quickly glanced at Lopez to see if he had seen me catch it, but he gave no indication. He was half-facing me at that point, still in the process of getting loose, so there was no telling if he’d noticed. DAMN!!! And yeah, okay, fine, so the logo was a bit messed up, but whatever. I had my ball, and I could tell what it was supposed to say. If I could get a better one that wasn’t so scuffed . . . awesome. But if I never saw another one . . . to hell with flying to Houston. I was all set. Can anyone identify him for me? I figured he recognized me, and I don’t mean that in a cocky way. What I mean is . . . I get that question a lot from random people who seem to know who I am, so when I told him, “Five thousand nine hundred and twenty-four,” I was surprised when HE was surprised. In the photo above, do you see the “STAFF” member on the steps in front of me? When I approached him, he turned around and asked to see my ticket. I responded by (a) admitting that I didn’t belong in that section and (b) asking if I could wander down a little closer to take a few photos. 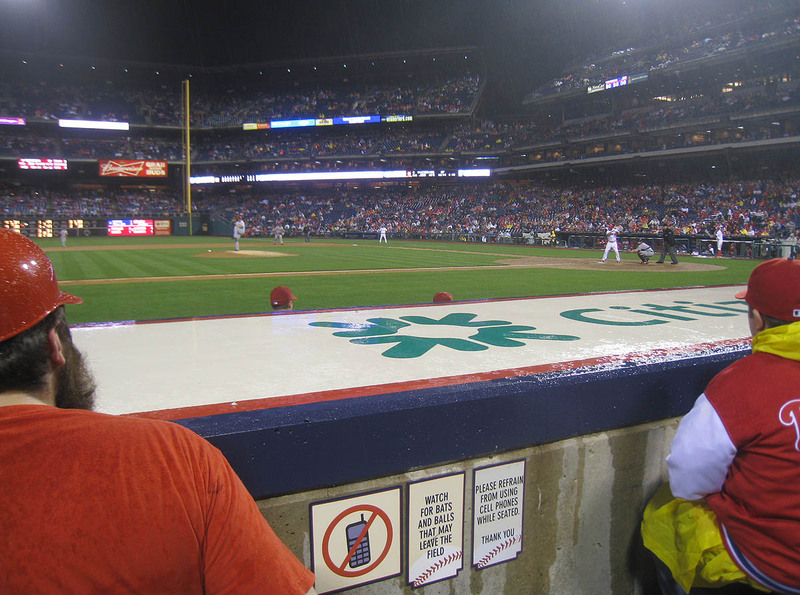 (Never admit to stadium security that you’re trying to catch baseballs. Always claim that you want to use your camera. It sounds much more innocent.) What did the guy say? He told me that I could go all the way down to the front row, but that I had to leave before the game started. Wow! I’ve been attending so many games lately in New York City that I’d forgotten how NICE it is at stadiums everywhere else. 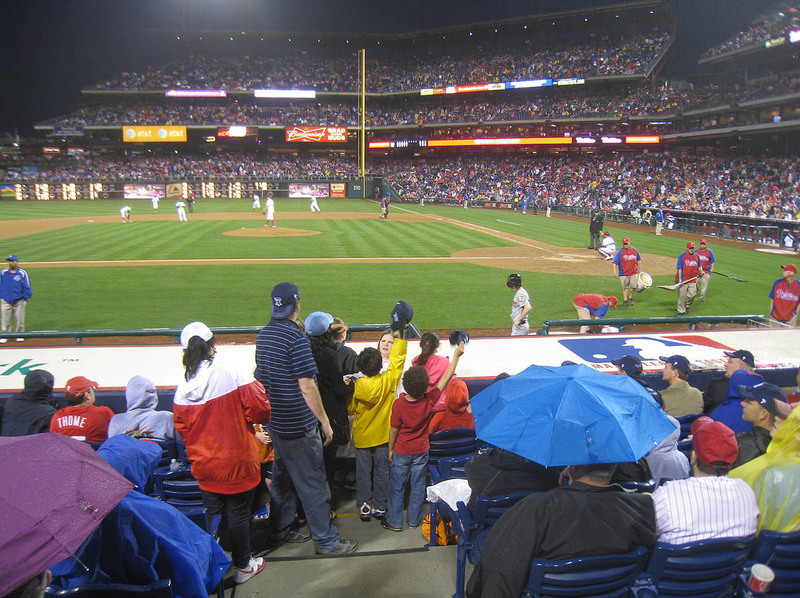 The Mets and Yankees should seriously take a lesson from the Phillies. This is how fans should be treated at baseball games. Anyway, I got two baseballs thrown to me within a five-minute span. The first came from Chris Johnson, and the second came from Jordan Schafer. Neither one of the balls was commemorative, so I gave the second one (my 6th overall of the day) to the nearest kid. By the time I took that photo, I’d already snagged my 7th ball of the day. It was the infield warm-up ball that the Astros had used when they first took the field. Bobby Meacham, the team’s first base coach, tossed it to me just before the bottom of the first inning got underway. It was a regular ball, but I was still glad to have it. One inning later, Placido Polanco (who, by the way, was sitting on 1,999 career hits), hit three foul balls off his foot in a span of four pitches. Every one of these balls rolled out into the infield. It was bizarre (and quite painful, I’d imagine). The final foul ball rolled all the way to Astros third baseman Chris Johnson. Johnson scooped it up and tossed it toward the dugout, at which point I stood up and walked down the steps to the front row. Some random trainer-type guy (wearing a striped, black-and-white polo shirt) popped out of the dugout and picked up the ball. I asked him for it, and he tossed it to me. Just like that. Soooooooooooo easy. There was absolutely no competition (which was a very nice change of pace from the typical mob of ballhawks in New York). Despite having absolutely no clue (staring off into space and not knowing who or when to ask), nearly all of those kids received baseballs before the game was through — and the ones who didn’t? They got hooked up by a ballboy at the very end of the night. I’m telling you, there were plenty of baseballs to go around. Call me a wimp if you want, but I’d been getting soaked, so it was nice to be covered for a bit. Something kinda neat happened in the bottom of the sixth inning . 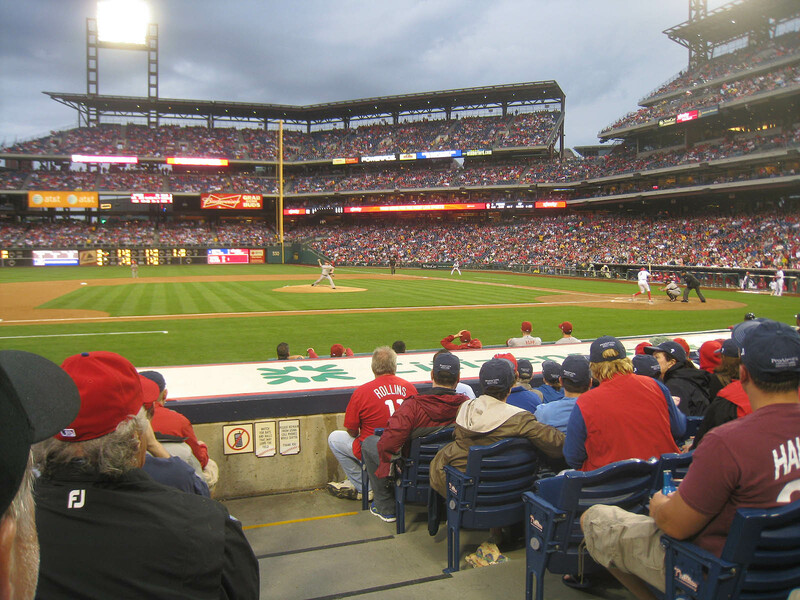 . .
With two outs and runners on 2nd and 3rd, Freddy Galvis ripped a single to left field. Placido Polanco, the lead runner, scored on the play, but John Mayberry was thrown out at the plate by Travis Buck. Astros catcher Chris Snyder made the tag, and when he returned to the dugout, he tossed me the ball. Where were all the kids, you ask? I have no idea. They were nowhere in sight. They only seemed to go down to the dugout when their parents told them to, and that seemed to happen only when Carlos Lee — the first baseman — ended up with the third-out balls, or when the Astros were warming up between innings. If I’d moved a bit quicker, I could’ve sat in the very front, but the guy pictured above with the helmet and beard beat me to it. No one cared. There weren’t any security guards micro-managing the movements of the fans. It was a beautiful, relaxed environment — the way baseball should be. Sneaking down to better seats is part of the game. It’s part of our culture. Who the hell stays in the last row when the seats closer to the field open up? My dad used to sneak closer with me when I was little, so the way I see it, every time I sneak around a major league stadium nowadays . . . I’m doing it in his honor. In the top of the eighth inning, Marwin Gonzalez, a switch hitter who was pinch hitting for Fernando Abad, hit his first major league home run. It was kind of depressing not to be in the outfield when it happened, but I wasn’t too hung up about it because I wouldn’t have caught it anyway. I would’ve been sitting several rows back in straight-away right field, and the ball landed in the front row, one full section toward the foul pole. Then, in the bottom of the eighth, Placido Polanco, who hadn’t homered since last season, ended up going yard for his 2,000th hit. If I’d been trying to catch that ball (which I suppose I should’ve been), I would’ve been sitting several rows back in straight-away left field, but the ball barely cleared the wall in left-center. No harm done, but still, it served as an semi-painful reminder than I need to focus more on catching homers. 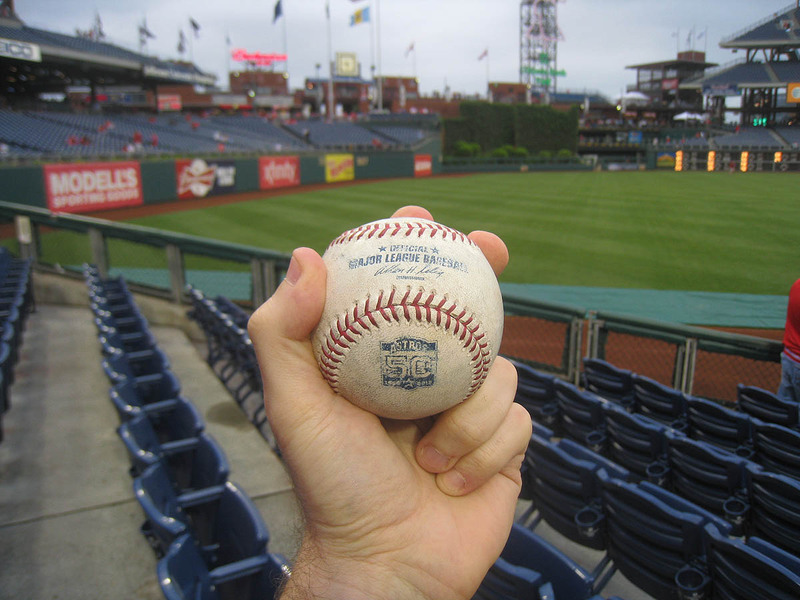 After Jonathan Papelbon struck out the side in the top of the ninth inning to secure the Phillies’ 5-1 win, I got my 10th ball of the day from home plate umpire Jerry Layne. Then I got No. 11 from that ballboy I mentioned earlier. He had unexpectedly poked his head out of the dugout, and then he tossed half a dozen balls into the crowd. 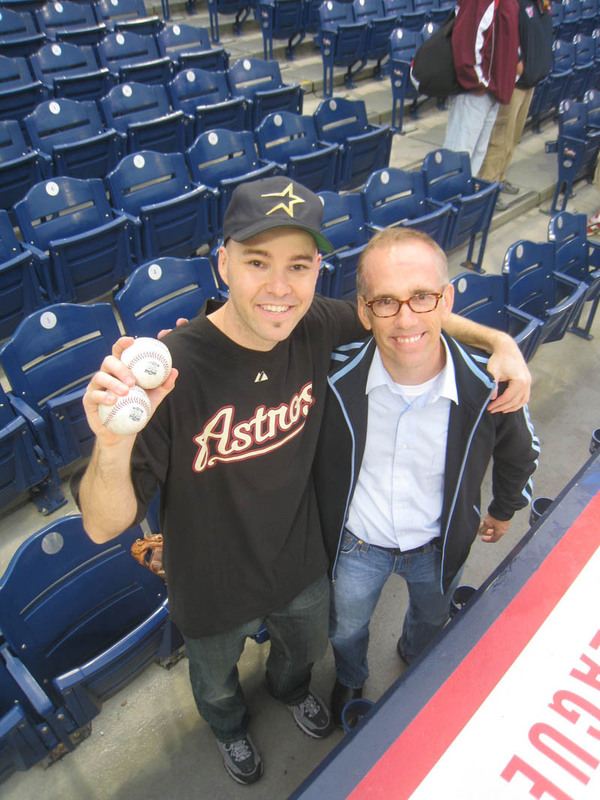 I gave away another ball before leaving the stadium and drove back to New York in near-record time. • 113 balls in 16 games this season = 7.06 balls per game. Im hoping the royals will have some orioles balls when I go to Kansas city Friday. Good job on the Astros balls. You’re planning to go to the Home Run Derby in KC? 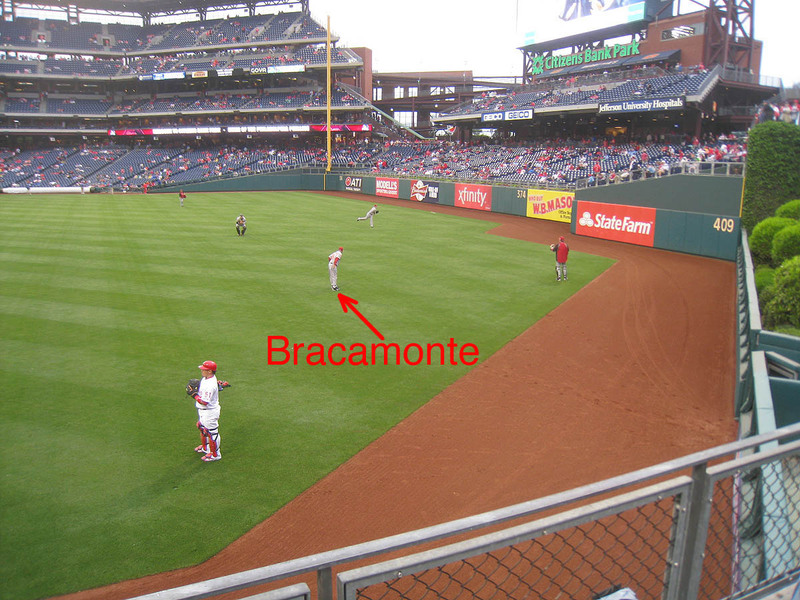 I saw the same player this weekend and he overthrew a baseball in my glove. Rhiner Cruz is the mystery Astro. Did you get the hat giveaway? I saw it on tv and it looked really nice! I love commemorative logos- a few weeks ago snagged a Fenway park ball from Bob McClure on a Sunday after he finished working out with Clay Buchholz in the bull pen. 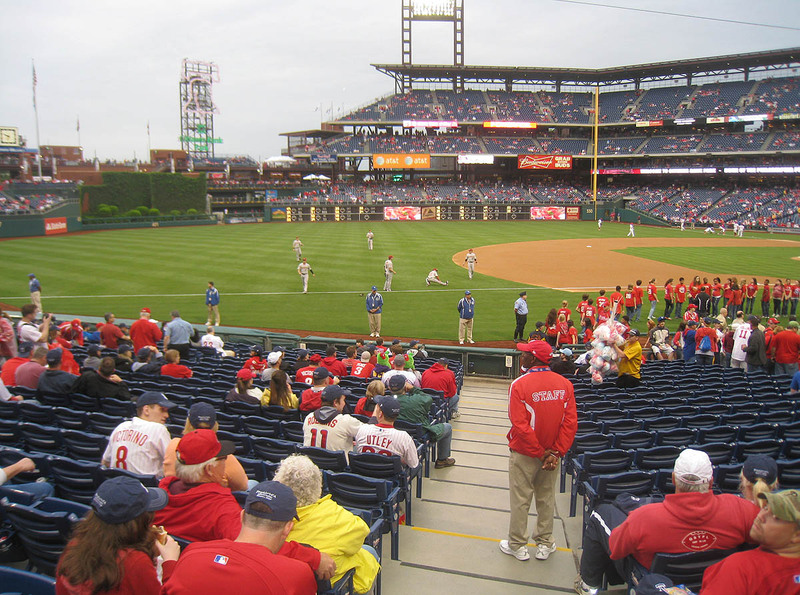 I was one of the first fans there, no batting practice, but it was cold outside, so the crowd didn’t start showing up until later— good luck with the rest of the logo baseballs! I love the commemerative balls! I hope to snag dodgers, red sox, and orioles ones in Oakland and Huston and NY ones in SF. Oh, and I am working on plans to attend the all-star game and HR derby. Any updates on the trip to LA? Nice entry Zack, and congratulations on the commemorative! But the real reason for this comment is to tell you to check out the M. Rivera tribute/parody song called…wait for it…”Don’t Stop Relievin'” The artist’s handle is NOC, and it is awesome! I don’t doubt it’ll bring a little sissy water to the eyes of every Mo fan out there. Hey, you’re halfway through the six commemoratives. I’m still on one–the Dodgers logo is pretty cool. Thanks and good luck with the Royals. No, but I’m thinking about it. Seriously? Thanks so much, but on a scale of 1 to 10, how sure are you? I got the hat and promptly gave it to a nice woman who’d been standing behind me outside the gate. Boston is awesome. That’s really all there is to it. Thanks. I’m hoping to get my hands on one of those Fenway balls soon. Let me know how your plans develop. 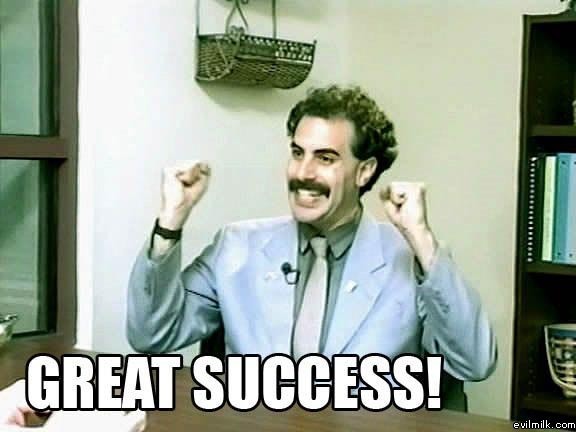 I bought eight tickets for the game on July 16th, and I’m planning to be there the next day as well. Thanks so much! I forgive you for the misspelling. Ha, okay, but I’ll have to do it later because I’m at work now, and my computer here don’t have speakers. Hopefully I’ll be two-thirds of the way there in five days. MARLINS PARK, BABY!!! Hey zack! I dont know if you heard, but the 2013 all star game is going to be held in new york! The mets are hosting it on july 16,2013. You should get some tickets for the homerun derby and the all star game! If im lucky, I might be going! 10. I am 100% sure. I like the logos on the Astros ball. Glad to see you are off to a good start and good luck this season. OK, NOC is not the artist, but some sort of YouTube sports show. Check it. 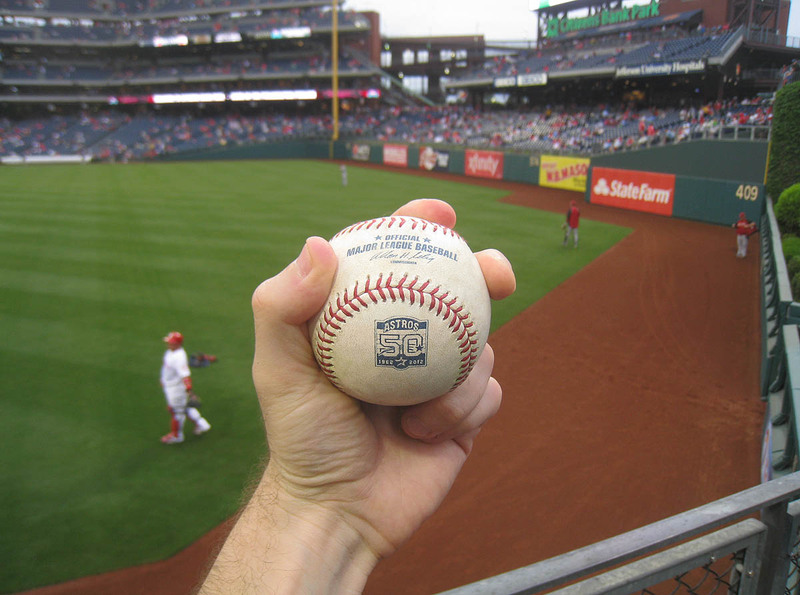 I don’t know what I admire more; your incredible skill at collecting baseballs in big league parks or the creative way you’ve converted that skill into the number 1 blog at MLBlogs.com. Great stuff! Yup, I’ve heard. I will almost certainly be there. Finally saw the video. Good stuff. I like the footage on the field right next to Yankee Stadium. Thanks SO much. Wow. That’s so nice of you to say. Nice game, whenever I go the bank it is almost always a sellout. 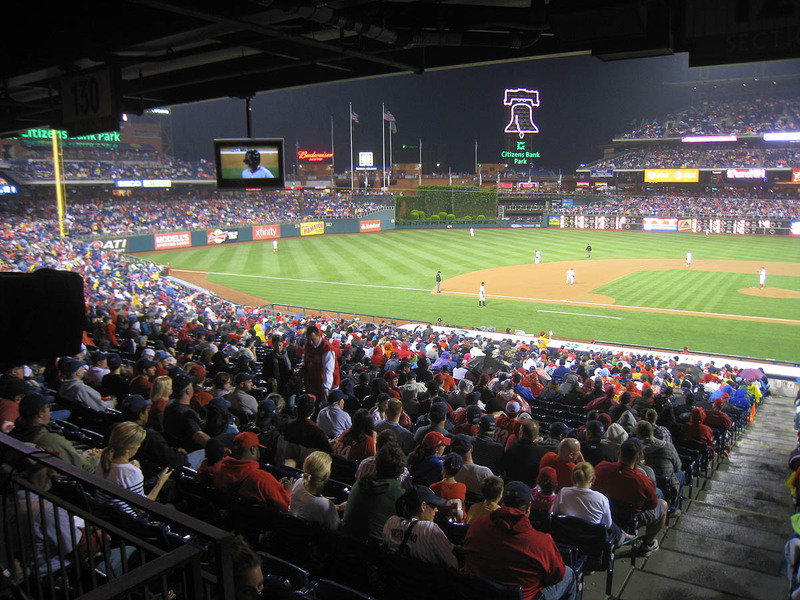 Will be going to any games at Citizens Bank park in the 2013 season? Thanks. I’ll probably make it down to Philly for a game or two next year, but I won’t even bother looking at the schedule ’til April.